For as long as I can remember (ok, three-ish years) I've wanted one of the All Saints sequin skirts. I used to wander in, look at it, sigh, and move on before anyone could see the tears sliding down my face. One day, I said, one day I'll have saved up enough coins from under vendors/bus floors to come back and make you mine. And then this little lookalike from Glamorous popped up and my heart stopped hurting, because that little All Saints hole was suddenly filled. The weather's just made the whole experience even more speicial -sequins are always fun, but there's something about summer that makes them even more appealing. Just... just me? Enough of my soppy confessions, I've got an exciting giveaway for you guys tonight. Lumo were kind enough to send over what has fast become my favourite ring. It's called the 'couple ring' and, as you may have guessed from the name, you can get you and your partner's initials engraved in it. If you want to have a break to be sick in your mouth, I understand, but I lurve it. The only downside is how sharp the end of it is; I went to push a hair out of my eye and the end went up my nose and scratched right down the inside, resulting in me making the weirdest cat-like cry you've ever heard. Only me. First of all, I want your hat. Send it to me in the post plz asap. Secondly, I really like that skirt. Send it to me in the post plz. LASTLY I like your face...you know the drill. Such a gorgeous skirt, I want it!! LOVEE this outfit, that skirt is beautiful and I LOVE THE RING! Beautiful! I like that you took on sequins for the day time- I never think I'll be able to properly pull them off, but you totally do. i love the skirt.. definitely not just you lovin the sequins! the pattern is beautiful as well. such a cute blog, i'm so glad i found you! 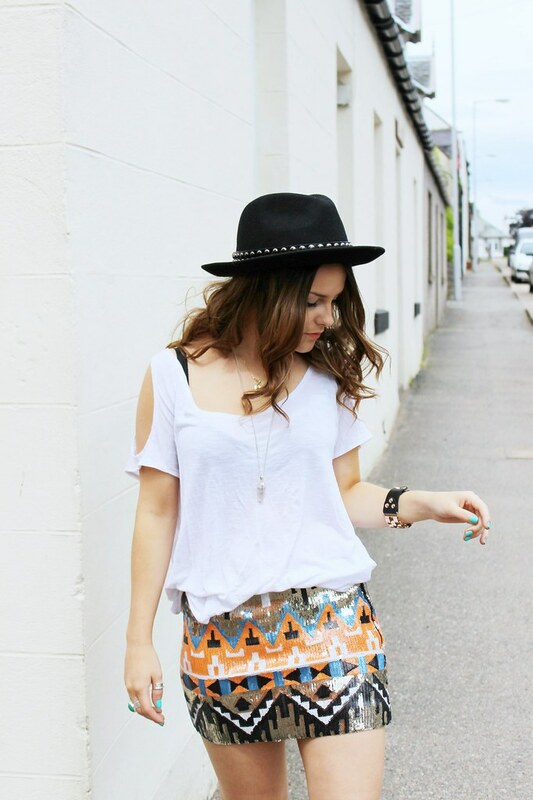 Love that sequin skirt & how youve styled it for daytime! looking beautiful like always, i love the skirt with the white top, and it has a cut out, love it! This skirt is so lovely! How did you find the sizing as I know sequin skirts can be a little be small. Ooooh, I do love this skirt! Sadly my legs are too long for my body so I doubt it would cover my booty. SIGH.